This report reviews more than a decade of drug sentencing reform efforts in the states of Washington, Kansas, Michigan and New York. The positive impact of reducing reliance on incarceration in these states shows the way towards increasing opportunities for effective drug treatment, and safer, healthier communities. The report also includes a brief example of how Kansas produced a net savings to taxpayers of $7.5 million, from FY 2004 to FY2008, through reductions in prison population levels. In addition, Positive Trends surveys strategies from Massachusetts, Arizona and Wisconsin for reducing racial disparity in the criminal justice system. Finally, the report highlights examples of “justice reinvestment” from Connecticut, Arizona and Kansas. Justice reinvestment is an emerging frame for shifting and often reducing spending on corrections, increasing public safety, and improving conditions in the “high stakes” neighborhoods from which most people are sent to prison and to which they return when released. 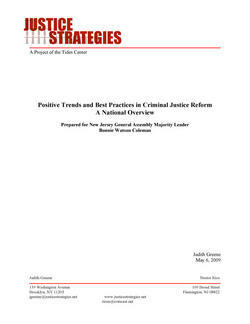 The report was prepared at the invitation of New Jersey General Assembly Majority Leader Bonnie Watson Coleman and presented as lead testimony by Justice Strategies before the “Counting the Costs” hearings of May 6, 2009. The hearing was part of a series of seven community-based public hearings across the state, sponsored by the Majority Leader, involving more than 1,500 advocates, activists, service providers, as well as formerly and currently incarcerated people, leading to a compendium of criminal justice legislative reforms signed into law by Governor Corzine. In this article, Justice Strategies' Director, Judy Greene discusses: the realities behind, now-again NYC Police Commissioner, Bill Bratton's ComStat and "broken windows" approach to crime control; the City's challenge to implement real reform after a US Court of Appeals upheld a Federal District Court ruling finding the NYPD's stop-and-frisk campaign an unconstitutional police practice; and, her call on Commissioner Bratton to embrace more collaborative policing practices finding success in the cities of Seattle, WA and Cincinnati, OH.